Prep an all-natural, food-safe household cleanser for pennies per batch. While more and more households are going chemical-free, no one wants to sacrifice cleanliness, especially in the kitchen and bath, where banishing bacteria is a must. Commercial non-toxic cleaners tend to be pricey, so why not make your own? 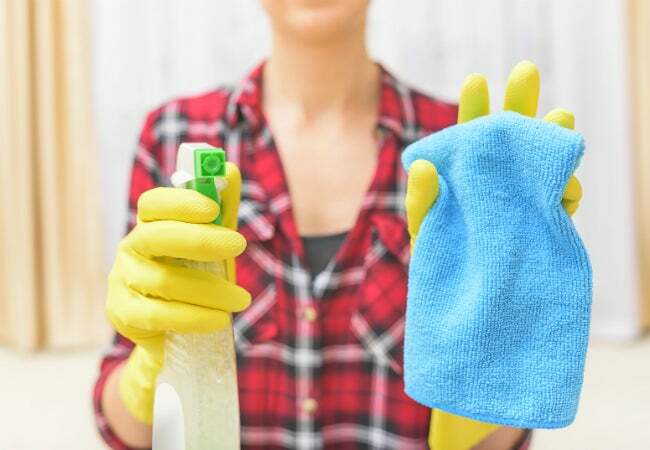 The low-cost, super-simple recipe here for homemade all-purpose cleaner is a blend of just three ingredients that you may already have at home, and the results will be safe to use around food, kids, and pets. The key ingredient is good old-fashioned white distilled vinegar, which is acidic to cut through stains and build-up while killing bacteria, viruses, and mold at the same time. But don’t hold your nose! This formula addresses the one big complaint most folks have about vinegar-based cleaners: the strong, lingering smell. Read on to blend up a custom-scented cleanser with a subtly pleasant aroma that will get your whole house sparkling. Use the measuring cup to pour vinegar and water into the spray bottle. Close the top and shake to combine. The solution is now ready to tackle loads of household cleaning jobs, but if you find the smell of vinegar off-putting, move on to Step 2. Select as many as three different essential oils to vanquish the vinegar smell. While you’ll make your choice based on scents you favor, keep in mind that some essential oils—including lime, eucalyptus, tea tree, lavender, and peppermint—contain antibacterial and antifungal properties to bring extra oomph to your cleaning solution. Add 10 to 12 total drops to your solution, close your spray bottle, and shake again to blend. Place a piece of tape on the spray bottle and mark it “Household Cleaner” so everyone in the household will know what’s inside. Clean away! Spritz a small amount of cleanser onto surfaces, and then scrub with a microfiber cloth, which works hard yet gently to lift grime without leaving lint behind. Repeat as necessary. Store the cleanser in a cool, dry place. A 32-ounce solution should last you quite a while! • Fridge and freezer: Wipe down the interior of your refrigerator and freezer, but avoid the rubber gaskets around the edges, which vinegar can corrode. • Laminate countertops: Swipe up most common spills, even those that have hardened. • Windows and mirrors: It’ll cut through grime, grease, and fingerprints. • Toilet, tub, and bathroom sink: It cleans and disinfects porcelain nicely. • Small appliances: It can de-scale a coffee pot or freshen up a toaster. • Glassware: Cut through hard-water stains and leave them sparkling. • Stone countertops and tiles: Surfaces made of marble and granite can be finicky. • Grout: Vinegar can break down the sealant on grout, leaving it vulnerable. • Electronics: The acids can eat away at the protective coatings on touchscreens, and in general its best to only use plain water on screens of any kind. • Cast iron and aluminum pots: It can corrode these metals. • Plants: Vinegar is a natural weed killer, but it doesn’t discriminate between the plants you like and the ones you don’t! Dust leaves with a damp cloth instead.